Keno is a game that’s seen as being completely chance-based, but there are some things you can do to maximize your payout rate in this game. One of the biggest perks of keno for many players is that there isn’t much to the game itself except for choosing a bet size and placing your wager. However, that doesn’t mean that there is no strategy in the game. In this sense of the word, we’re talking about strategy as in the ability to make decisions that will maximize your overall payout rate. What your exact options are will depend on the exact game you’re playing, but game selection itself is also a big consideration. * Xperiment is an alternative version of keno available at Playtech-powered online casinos that has the exact same pay table and betting options as their normal version, though it has different graphics. From the four options above, your best software to choose for keno is Rival Gaming, though the much more popular Microgaming is not far behind. From the list above, we’re going to take a more in-depth look at the Vegas Jackpot keno game at Rival Gaming-powered online casinos since it’s a little atypical and offers a much higher payout than virtually any other keno game running online today. In this game, you can pick up to 10 numbers, which is a bit different than the normal option to pick up to 15. You’re still picking out of 80 numbers, however, and the interface is completely normal compared to other keno games. As you can see from the above chart, your best option is the pick 10 for a payout rate of 96.48 percent. The closest alternative is the pick 8 for a payout rate of 95.84 percent. Alternatively, the worst bet is the pick 1, which is usually the case in virtually all forms of keno available online and in land-based casinos. It makes a lot of sense to simply go for the highest payout option and let that be the end of. However, some players will not be so happy with the high volatility that’s inherent in something like the pick 10 in a keno game. Because there’s more variance and volatility the higher the number of picks go, some players prefer to take a wager that has a slightly lower house advantage in exchange for a much lower level of variance. In the above example, a player might go with a pick 4 bet instead of a pick 10, even though it gives up a few percentage points on the total payout percentage. The reason for this is that the swings up and down will be much more manageable. This is more a matter of personal preference than total overall strategy, but it’s definitely something to keep in mind if the best bets in your particular game of choice also have a high level of variance. Keno is a game that doesn’t have a ton of strategy involved in it. With that having been said, you’ll still have a number of options for maximizing your total payout rate, and as we’ve seen above, it can make a pretty big difference. 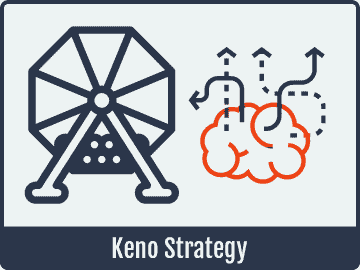 Unlike many other games, game selection is actually a major part of the strategic process for keno, and you can see that from the fact that the best bet in RTG’s keno game has a payout rate around 10 percent lower than that in the best case for Rival Gaming’s software. Overall, game selection and choosing the number of picks are your main options for applying strategy to keno, and that’s plenty for most players who love this lottery-style game.